Happy Friday! Today in the What Caught My Eye series, we’re heading to one of my favorite places to shop for modern furniture and home decor - CB2! CB2 is the like the hip sister brand to Crate & Barrel - it’s a little edgier and willing to take more risks when it comes to design and styles. 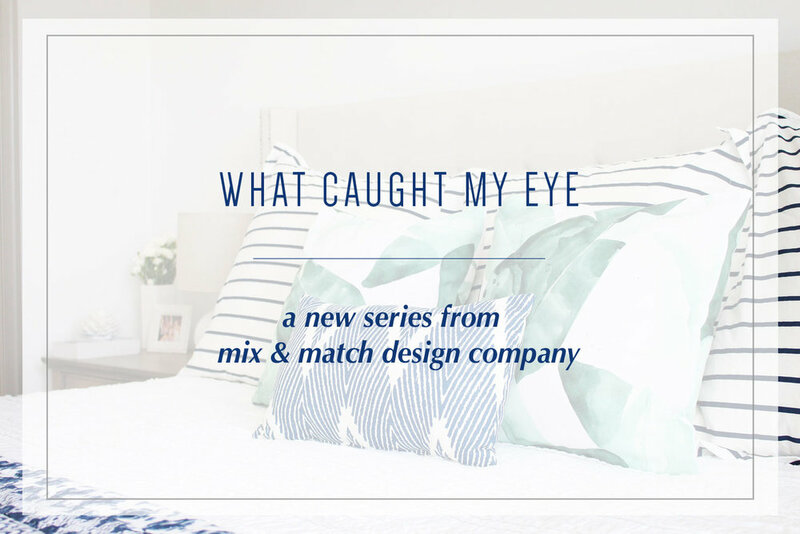 It’s not as well known as Crate & Barrel, but if you’re a fan of furniture and home decor that leans in the more modern, glam, or eclectic direction, it’s a brand you’re going to want to get to know. I love that they design their own pieces, and while some of them are a little bit outside of my comfort-zone style-wise, I really admire the creativity and interesting details that their designers bring to the table. When it comes to price point, I’ve found CB2 to be really reasonable. It’s not inexpensive, but you also won’t feel like you need to take out a second mortgage to purchase a sofa from them. They also do have some surprisingly affordable pieces that you might not expect - especially in the lighting and tabletop departments. A lot of their smaller pieces (think everything from side tables to decorative accessories) are also quite budget-friendly and look a lot more expensive than they are! Now let’s take a look at what caught my eye. I focused my hunt for all the pretty things on their newest collection, which came out just a couple of weeks ago! As I’m sure you’ll notice when you take a spin through my favorites, I was drawn to a lot of pieces with clean lines and brass detailing. My love of warm metals continues! You’ll see touches of brass in everything from the round dining table to the lighting I picked out. I was also digging the natural textures I saw in a lot of the pieces in the new collection. The cane bar stool, oval baskets, and wooden side table are prime examples. What’s catching your eye in this roundup? Below each image you’ll find text links for my favorite products (in order from top left) and you’ll also see a slider of clickable images that will take you right to the item on the CB2 website. (If you’re on a feed reader or in your email, you’ll need to head to the full site to access that feature.) Happy shopping! Teal Sculptural Modern Sofa: Perfect for a more formal living room or a lesser-used seating area, this tight-back sofa caught my eye for a lot of reasons: the teal velvet fabric, the splayed brass legs, and the masculine-meets-feminine lines. It also comes in a fun ivory wool fabric if you’re looking for something a bit more neutral! Modern Swivel Plug In Wall Sconce: This “praying mantis” style wall sconce is perfect for tight spaces that need a little something special. Place one by an accent chair or use two of them as bedside lamps. Since they’re plug in, they’re super easy to install - no electrician needed. Also, don’t miss the beautiful walnut wall plate detail. I love it paired with the brass and black finishes. Faux Olive Tree: Olive trees are the new Fiddle-Leaf Figs, y’all, and I’m not mad about it! Their delicate silver-green leaves are gorgeous and I love the tree’s shape. From what I understand, they can be a little tricky to grow indoors, so be sure you have the right light for one if you’re going real. This faux one looks like a great alternative if real isn’t an option! Marble Notched Cylinder Knobs: Ever since I discovered their hardware a few years ago (we used their brass hexagon knobs on our kitchen cabinets), I’ve been a huge fan. Ranging from unique to more utilitarian, CB2 has a great selection of knobs and pulls that you can use anywhere from your kitchen to your dresser drawers. They just released a bunch of fabulous new ones, so go check them out. These marble notched cylinder knobs are just one example! 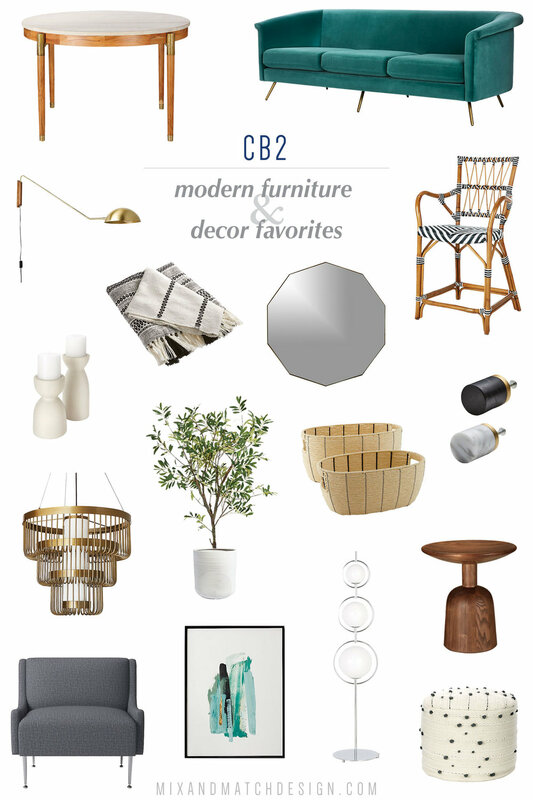 So tell me, have you ever shopped at CB2 for your home? Do you have any favorite pieces?